Pack for a Purpose makes it easy for travelers to take needed supplies to the destinations they visit. Now, Giving Assistant makes it easy for shoppers to help Pack for a Purpose continue to make a Big Impact around the world. 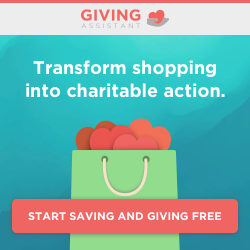 When you sign up for Giving Assistant, you’ll earn a percentage of cash back on your online purchases at any of the more than 1,800 participating retailers, including Macy’s, Target, and Hotels.com. Then, Giving Assistant gives you the option to donate that cash to a participating nonprofit organization. By choosing to donate to Pack for a Purpose, you help sustain our mission of positively impacting communities around the world by assisting travelers who want to take meaningful contributions to the destinations they visit. Sign up for Giving Assistant here and install the Giving Assistant Button on your browser so you never forget to earn and donate your cash back — especially this holiday season. Every ounce of supplies taken by Pack for a Purpose travelers has added up to over 65,000 kilos donated in over 60 countries. When you use Giving Assistant for your everyday purchases, no matter how big or small, every cent adds up. Want to find out other ways to easily pay it forward to PfaP with your purchases? Learn more by visiting our Shop page. Categories: Updates Tags: Benefit Pack for a Purpose, Big Impact, Charitable Giving, charitable shopping, charity, contribute to Pack for a Purpose, donate, Giving Assistant, Giving Assistant and Pack for a Purpose, giving back, holiday shopping, Pack for a Purpose Shop, PfaP Shop, social good, Support Pack for a Purpose, What is Giving Assistant?